Your grip on the knife is determined as much by your personal preference and comfort as it is by the cutting tasks at hand. The same is true for your guiding hand, the hand responsible for controlling the food you are cutting. The guiding hand, the hand not holding the knife, is used to hold the object being cut. This is done to prevent food from slipping as you cut it. 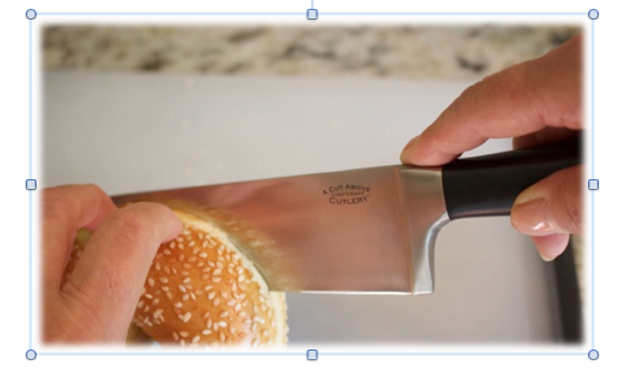 It also makes it easier to control the size of the cut or slice you are making. One of the classic positions for the guiding hand is illustrated in Figure 1. The fingertips are tucked under slightly and hold the object, with the thumb held back from the fingertips. The knife blade then rests against the knuckles, preventing the fingers from being cut. When you peel or trim foods, cut them into tournées, or flute them, you may find yourself holding the food in the air, above the cutting surface. In that case, the guiding hand holds and turns the food against the blade to make the work more efficient as illustrated in Figure 2. Be sure that the food, your hands, and your knife handle are very dry. Certain cutting techniques, such as butterflying meats or slicing a bagel in half, call for the guiding hand to be placed on top of the food to keep it from slipping, while the cut is made into the food parallel or at an angle to the work surface. Holding your hand flat on the upper surface of the food with a little pressure makes these cuts safe to perform. This is illustrated in Figure 3, and in the image below. The guiding hand is also used to hold a carving or kitchen fork when disjointing or carving cooked meats and poultry. The tines of the fork can be laid flat on the surface of the food or inserted directly into the item to hold it in place as it is carved. Bagels, yum. Stay tuned for our next entry in the series- Mincing!